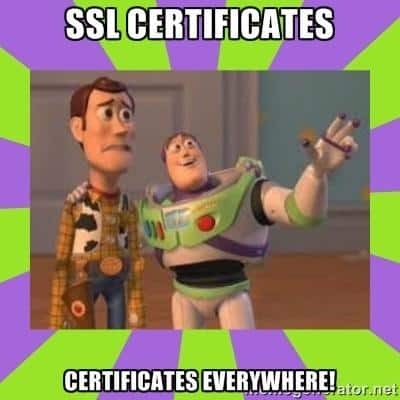 Google’s recent announcement that SSL certificates are a ranking factor has created a bit of a rush to get sites secured. Lets be perfectly clear for just a moment, having SSL on your site is far, far less of a ranking signal than having content, links, architecture and everything else that we typically think about in SEO on a day to day basis. IF you think converting your site to a secure one will instantly give you a massive boost, move on. Why should you get your site on SSL? Plenty of reasons, but to put it succinctly, there’s nothing wrong with being more secure. If you sell stuff, its a no brainer, even if you dont but have a login area, its highly recommended. If your site is nothing but content, with no login area, no CMS, nothing that can be traditionally compromised its still potentially a good idea to prevent MITM attacks. Why shouldn’t you get your site on SSL? Frankly, quite a few reasons why might not want to as well. All elements of the page need to be provided in secure connections. You might not think thats a big deal, BUT, do you embed any external images? Any content? Any Social Media Plugins? Any Analytics? Any Tag Containers? Starting to get the picture? Its not quite as easy as just flicking a switch. There’s also some latency issues associated with moving to SSL as well, and performance is of course also a ranking factor. There’s not much point in me going into detail on that when you can just read Yoast’s awesome SSL tips and tricks post. I want to install an SSL Certificate – How much is it going to cost? It needn’t be expensive, but consider this: in life you get what you pay for. It seems highly unlikely that when even expensive 2048 bit SSL certificates can be hacked, that a free certificate offers much in the way of security against a dedicated hacker. That being said, installing a free certificate at least lets you try out what you’re getting yourself into, and working out whether you want to bother paying for a decent certificate. http://www.startssl.com/ – yes, its actually free. Also includes a guarantee, but don’t expect any frills. http://ssl.comodo.com/free-ssl-certificate.php – its a 90 day free trial from Comodo, who are a recognised supplier. Granted not “free forever”, but frankly not a bad choice if you’re testing. As per Google, the recent update on SSL is going to affect around 1% of search queries. So it is clearly understood it is not meant for all websites. Furthermore Google is now testing it and will give enough time to companies to move there websites from http to https. If anybody consider to make this transition then a proper 301 permanent redirect must be done from http to https otherwise there will be lots of canonical issues. promozseo NOTE: LINK REDACTED BY ADMIN.